Most people assume that wine coolers are designed to look like small refrigerators or even as cube-shaped items. However, wine coolers are amazing to find these days as they can include many types of bodies. These include options that can be a little more rectangular in size as well as a few choices that are small enough to where you can place them on top of a larger counter. You will certainly be amazed at what’s around and today you can use a model from Wine Enthusiast to give you the storage needs you have in mind. In fact, there’s one product from Wine Enthusiast that could prove to be even more advantageous for you to have. 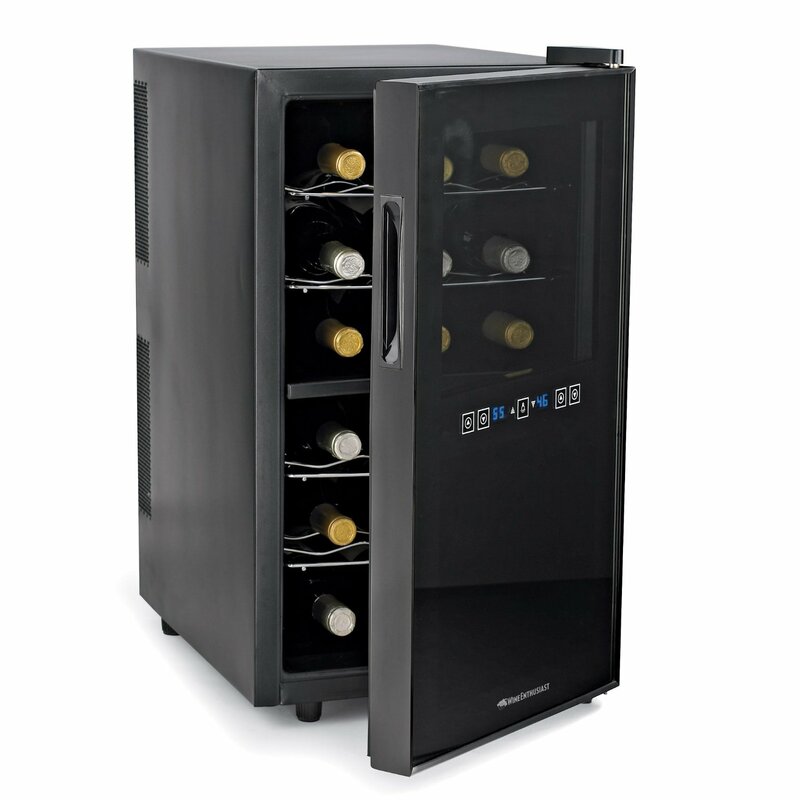 The Wine Enthusiast 18-Bottle cooler with its touchscreen feature is one particular model that proves just how unique such wine coolers can be. This is a cooler that is designed with a more vertical alignment in mind. It is also designed with a special control system that allows you to easily adjust the temperature within the refrigerator as required. If you use this properly then it should be very easy for you to have a well-chilled wine at any time. The design of this Wine Enthusiast refrigerator is a big aspect of what makes it popular. This offers a body that is about 37.5 inches in height and is only 9.9 inches wide. This is designed to be very beautiful and attractive in most homes. Another advantage of this Wine Enthusiast wine cooler is that it has a black body with a striking series of stainless steel accents around the corners. Each accent is designed to create a beautiful look on the refrigerator to give you a style that is truly special. Meanwhile, the glass materials for this cooler are limited to the top half of the space. This design creates a smart look that has a professional style this is fine to have in your home or any other space where you need such a cooler in. This cooler has two separate zones. The first can hold up to ten bottles at a time. Meanwhile, the bottom zone can hold eight. Each has a series of shelves that you can pull out and remove as needed. This gives you more versatility as you can store a higher number of bottles at a given time. The two zones have their own compressors that will generate cool air on their own terms. You can use these separate zones to create a sensible amount of cool air so you’ll have more control over what you have. These two zones will operate with different temperature settings though. The top works at a range from 54 to 66 degrees Fahrenheit while the bottom runs at 46 to 66 degrees. The touchscreen feature on this wine refrigerator is also a great part of what makes this cooler so special. The touchscreen is located in the middle of the door and has a series of buttons that you can quickly adjust. Specifically, you can adjust the temperature within the cooler to your liking. This is perfect for when you’ve got two different types of wines to work with. The key for storing wines with this fridge is to ensure that you know that exact types of wine that you have to work with. This comes as there are two different halves to work with and either will have its own capacity. Make sure you look at what you have before adding anything into your fridge. Compare the options you’ve got and make sure you plan ahead. Don’t forget to think about the bottles that you have as well. The fridge works well with 750mL bottles but it can handle anything else provided that you just shift the shelves around to fit in whatever you have carefully. You will have to certainly consider this Wine Enthusiast wine refrigerator if you want to keep your wines chilled as well as possible. This is a great product that will do more for you as you will keep your wines cooled for as long as needed without worrying about any temperature problems. It's especially appealing and can do well for quite an extended period of time when it's all considered.